You never know what may happen while you're out on a long run. Hope for the best while you prepare for the worst with the ID bracelets and shoe tags for runners from Gone For a Run. 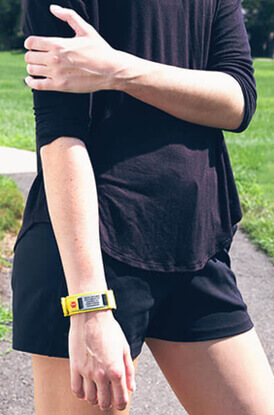 Wearing a wristband or shoe ID engraved with your personal information can help first responders and other medical professionals identify you quickly if something happens to you while you're out running or going about your other daily activities. These identification tags are especially important if you have medical allergies or a chronic medical condition. Warning medical professionals of your special medical needs at a glance can mean the difference between life and death. Our IDmeBAND runner's ID bracelets are made from high-quality materials such as silicone, tech nylon and paracord. These durable materials are made to stand up to your active lifestyle so that they are able to last through hundreds of runs without needing to be replaced. Most of these ID bands feature adjustable sizing with buckle closures. Each one features a laser-engraved, stainless steel ID tag that is customized with all of your personal information. Add your name, city, state, country, emergency contact phone numbers and medical allergies to your ID tag. Some of our runner's ID band options also include a second custom plate for a double-sided bracelet. Others include a handy strap that can hold gel pouches and other small items. If you have trouble remembering to wear a bracelet or simply find them uncomfortable, our shoe ID tags are a great alternative. These aluminum or stainless steel tags feature all of the same personal information and can be woven easily into your shoelaces. After you've attached these ID plates to your running shoes, you won't have to think about it again until you change to a different pair. All of our medical ID tags for runners are made to be weatherproof and long-lasting. In addition to providing easy identification for runners, these ID tags also work well for many different kinds of athletes. If you are a walker, hiker or cyclist, an ID tag is essential for your safety and wellbeing.